If you are one of the many families living paycheck to paycheck, budgeting can be a challenge. There are so many tools available to help people come up with a budget that works for them. Unfortunately, I have never purchased any of these tools, so I cannot say what I like or dislike about them. However, I can share with you a tool that I have been using for years that is simple and allows me to see where the money goes. It’s called Microsoft Excel and basic first grade math. It is common to receive a paycheck twice a month (rather than weekly), making it harder to budget appropriately when predicting your expenses. I know a lot of people who pay their mortgage/rent with one paycheck, leaving them with very little for anything else until that second paycheck rolls around in two weeks. Trust me. I’ve been there. I’ve come up with a way to have an even bi-weekly budget, so that I am paying approximately the same amount towards bills with each paycheck, and so that at the end of both payment cycles, I have the same amount of money for other necessities. The first step in creating any budget is figuring out your expenditures. Be honest with yourself! If you spend $200 a month on Starbucks, put it on the list! Here are some other examples of what you may need to include on your expense list. The second step is a little tricky. Once you have the costs, you’ll need to divide them as evenly as possible between your two pay periods (sample sheet below). 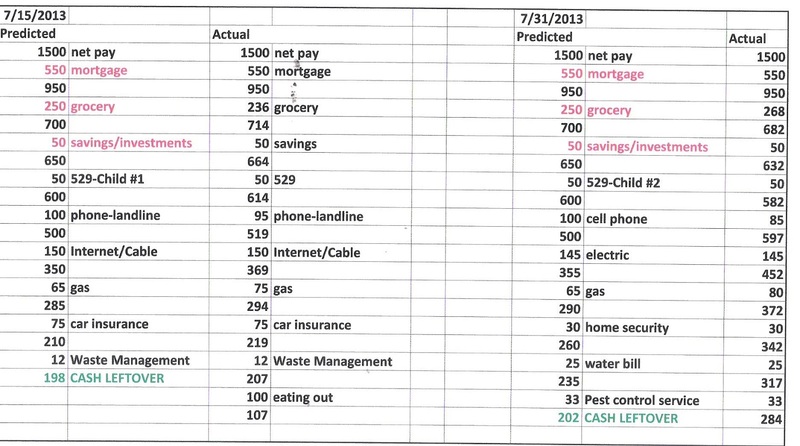 So, if your total monthly expense is $2600, you will want to try to split up your bills so that you pay $1300 with one paycheck and $1300 with the other. Please also pay attention to when your bills are due. The sample sheet I’ve come up with is based on a salary of $3000/month net (no, this is not my income; I am just using this figure to make things easier). In the below spreadsheet, I decided to pay the 529 account, the landline phone, internet and cable, car insurance and waste management bills with the first paycheck of the month. I decided to pay the 529 account, the cell phone, the electric, the home security, the pest control and the water bills with the second paycheck of the month. *You’ll notice that even though I do not pay my mortgage twice per month, I listed a mortgage payment for both pay cycles. Rather than paying the large mortgage payment with one paycheck, I divided the mortgage amount and added it to both pay periods. It’s sort of like writing a check to yourself and cashing it when your mortgage is due. I did this to distribute the expenses more evenly. Please feel free to divide your expenses as you see fit. This is just what works for us. 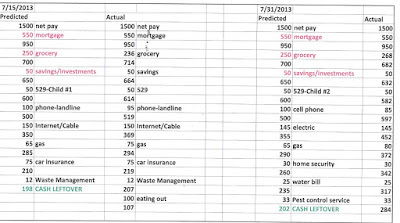 As you can see, I also have a “predicted” column and an “actual” column. The “actual” column isn’t necessary, but I like to see where my money goes. For instance, if I decide to buy something for myself or go out to eat, I note it as an extra in the “actual” column. This way, every month, I know exactly where every penny went. It’s also interesting to see monthly spending trends. I’ve found that deducting money from each paycheck every month in smaller amounts doesn’t hit the pocket as hard when it’s time to pay the bills. Is this the very definition of paycheck to paycheck living? Possibly, but it doesn’t ever stress me out in the way that “paycheck to paycheck living” is normally described. When it comes down to it, you should have the same amount of money to play with regardless of how you decide to budget. I hope you find the way that works best for your family.